We’re here to help you find the best tree planting program for you! Use this helpful guide for tree programs, giveaways, and coupons available to Montgomery County residents and businesses. Street trees provide essential benefits to every community. In Montgomery County, the Street Tree Program plants hundreds of street trees every year. If you want the County to replace a street tree or plant a new one, submit a request online, or contact the Division of Highway Services by calling MC 311 (Outside of the County: 240-777-0311 / TTY: 301-251-4850). Many of the cities and towns in Montgomery County have street tree planting programs. For more information about programs in the Cities of Rockville and Gaithersburg, click their dropdown on this page. For other municipalities, contact them directly for more information. 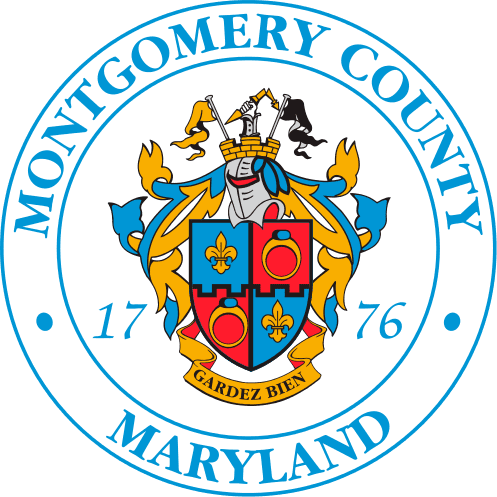 Shades of Green, a program of the Montgomery County Planning Department, provides free trees and planting for qualifying property owners in urban areas of the County. Eligibility and qualifying neighborhoods are listed on the website. A list of tree species and the sign-up form is also found on the website. The City of Gaithersburg has a Rainscapes Rewards Program like Montgomery County and Rockville. The program aims to help most property owners improve stormwater runoff conditions on their property by installing natural drainage projects. Trees are included in this program through the Conservation Landscaping Rebates! Gaithersburg’s Historic District Commission will assist property owners in historic areas to determine whether or not replacements are needed when trees are removed and, if so, provide a list of recommended species. This information is made available through the tree inventory and tree care program sponsored by Gaithersburg. Join Gaithersburg in continuing their commitment to the environment by planting a Commemorative Tree in select City of Gaithersburg parks or public areas. 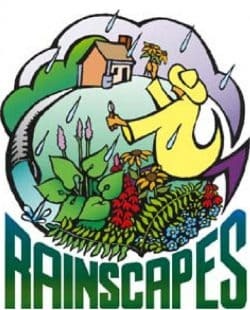 The City of Rockville has a RainScapes Rewards Program like Montgomery County and Gaithersburg. The program aims to help most property owners improve stormwater runoff conditions on their property by installing natural drainage projects. Trees are included in this program through the Tree Canopy Rebates! The City of Rockville plants new trees as part of their street tree maintenance program. To request a new street tree near your home, fill out the Tree Service Request Form or call the Parks and Facilities Office at 240-314-8700. Have other Rockville tree questions? Visit their general information webpage. Residents can take advantage of the Marylanders Plant Trees program to plant more trees! 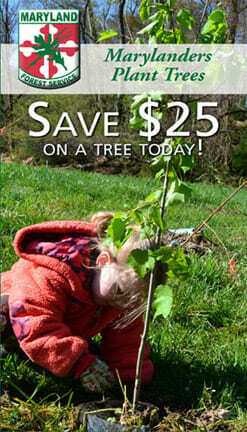 Download a coupon to receive $25 off the purchase of a native tree at participating nurseries across the State. On residential properties, the Maryland coupon can be combined with the Leaves for Neighborhoods coupon for additional savings. This program is sponsored by the Maryland Forest Service. The Montgomery Planning Department sponsors the Leaves for Neighborhoods program to increase the County’s tree canopy on residential properties. Download a coupon to receive $40 off the purchase of a native tree with a retail value of at least $75 at participating nurseries. This coupon may be combined with the Marylanders Plant Trees coupon for additional savings. The Backyard Buffers program provides trees and shrubs to homeowners to create streamside buffers. Property owners with a stream or other waterway on, or adjacent to, their property can receive a free “buffer in a bag”. Each bag includes 20 to 30 native tree and shrub seedlings, each approximately 1 to 2 feet in height, and well adapted to streamside conditions. Once these trees and shrubs are established, they will provide benefits to both you and the stream. The popular TREE-Mendous Maryland program helps volunteers restore tree cover on public land and community open space in Maryland, including parks, street trees, and schools. Trees are provided at low prices. Technical assistance to plant and maintain the trees is also available. Additional funding to support planting projects on public land and open spaces is available through the MUCFC Grants Program. The Maryland Urban and Community Forestry Committee (MUCFC) Grants program helps community groups to enhance their urban forests by providing funds to plant trees and carry out education projects. Community tree projects must be located on public lands in parks, cities or towns. Trees and technical assistance for these projects are available through TREE-Mendous Maryland. You can use simple landscaping techniques on your property to encourage rain to soak into the ground and reduce the amount of runoff. They include rain barrels, rain gardens, conservation landscapes, and permeable pavement. These RainScapes save money, reduce flooding, and decrease pollution in our local streams.